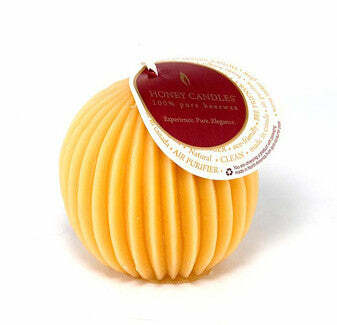 Honey Candles® Natural Fluted Sphere is handmade with 100% pure Canadian beeswax. Measuring in at 3" by 2 3/4", it makes for a beautiful decorative candle, perfect for the holidays, as a gift, or simply as a home decor item. Like all of our 100% pure beeswax candles, the Fluted Sphere is eco-friendly and good for your health, with absolutely no carcinogens or hazardous products, and a long smoke-free burn that emits special compounds to neutralize airborne allergens and toxins. You'll love the soft honey aroma, and the characteristic warm glow of a pure beeswax candle, with a natural light that closely resembles that of the sun. Ornamental candles are not symmetric top to bottom so they may need a little more loving attention. If the melt-pool moves too close to the edge of the candle, trim the wick for a smaller flame. Tip: Instead of blowing out your beeswax candles, dunk the wick into the wax pool and straighten. When you light your candle, light at the base of the wick as opposed to the tip. Honey Candles is a Canadian company that is not your ‘average’ beeswax candle maker. Honey Candles has been around since 1994. Every candle we make is hand poured or hand dipped. Quality comes before all else. It would be easy to look at the market and say that maybe our standards are too high, that maybe we could cut some corners. But instead we have moved forward making our labels ever more sophisticated and our candles always beautiful. Roy and Leah Honkanen are the owners at Honey Candles and that’s the way they like it. So do the employees. It feels good to be part of an organization that cares enough to put only the best beeswax they can find into their natural beeswax candles. It is empowering to be part of the decision making. Suggestions and new ideas for candles by the employees are always considered. No wonder only elegant and beautiful candles leave our shop – they are made in an atmosphere of respectful collaboration. The Honey Candles shop is near Kaslo BC overlooking pristine Kootenay Lake in Southern British Columbia. We are an exceptionally reliable source of beeswax candles and incense sold under the brand names Honey Candles® and Jin Incense®. We are known for our prompt, thoughtful and pleasant customer service. We work to create variety in our lines because we know it makes our customers happy. We have made a commitment to social responsibility and sustainable manufacturing practices.